Usually I figure nothing goes in before St Patrick’s Day – peas rot if the soil is too wet and chilly and everything else just hangs fire, so you’re not getting any farther ahead unless you’ve put them into a pre-warmed bed (black plastic laid down for several days will warm one up considerably) and then have covered planted seedlings with plastic-covered hoop tunnel. I rarely pull myself together enough to do either of those things, and haven’t done so this year, but so far, since we seem to be about four weeks ahead in terms of temperatures and bloom times, I figured I’d chance it with a few cool weather greens and vegetables. 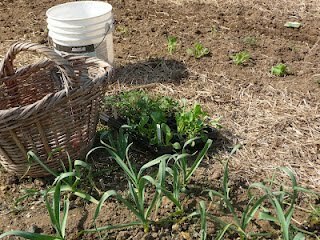 I chose to put this year’s early greens in a bed on the garden’s northwest side. The space is kinda protected by the dilapidated fencing and is in the lee of a white pine and cedar. It took a couple of hours two days ago to prep it. First, off came last year’s detritus and remaining straw mulch that I should have taken care of last fall and didn’t. Then I stuck a fork in it every foot or so to loosen the soil a bit and aerate it. Then down on my knees to dig out the henbit, dandelion and peppergrass. Up again to shovel compost over the now weed-free (for a time anyhow) bed, then raking to smooth it all out. Then in went some French breakfast radish seeds, just a few – I’ll plant more in a couple of weeks – the seedlings (dinosaur kale and dwarf pak choi) – and then the pea seeds, which were called Dark-Seeded Early Peas, though the seeds didn’t look any darker than any others I have. The seedling installation is an experiment – I held back at least half of those available – since it is unseasonably warm and they are on the small side. Even so, I stuck them in hoping that they would produce an early crop in just a few weeks for stir fries. The peas went in on the north side of them, so they don’t shade the plants. They’re in a thickly-planted double row, closer together than the packets always call for since A) I didn’t bother to find my pea and bean inoculant, which boosts the germination and yield, and B) I figured if every one of those seeds did come up, I could thin them and steam the young shoots, so it’s win/win. 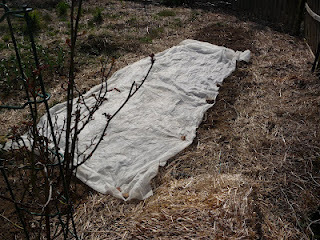 Once planted and lightly watered, I covered the whole thing with row cover, in part to protect them from any frost that may be coming down the pike in a few days, in part to stave off ravening rabbits and birds, who have an unerring nose for pea seeds. I’ve seen robins walk down a row and pluck every last one from the soil. Like crows, who are incredibly smart, robins can discern and follow a pattern. The rest of the flat will go back into the shelter of the garage to harden off, and, if necessary back into the greenhouse with the other seedlings. Fingers crossed, the vegetable garden is begun! I will say, this year, the cold season crop have an early start by 10 days. You're right, Nickolas. And it's a little disconcerting, but I've also seen a frost way into May over here in the upper Eastern Shore. Then again, we could discuss changed bloom times! The poor planners for the Cherry Blossom Festival in DC. and our own Dogwood festival, which since inception was slated for the 3rd week in May, have been completely flummoxed by the shifting timing.